Since 2010 I’ve been making lists of the year for upcoming movies I’d like to see, and posting them at a friends forum at DanBirlew.com. I revisit these lists about midway through the year and give them an update to mark what I’ve seen, add additional upcoming films since announced, and move ones which have been pushed back to a list for the next year. I make the lists from looking through news posts, IMDb upcoming film pages, Black List scripts that have been produced, trailers I’ve seen and just what I can remember looking forward to for the year. 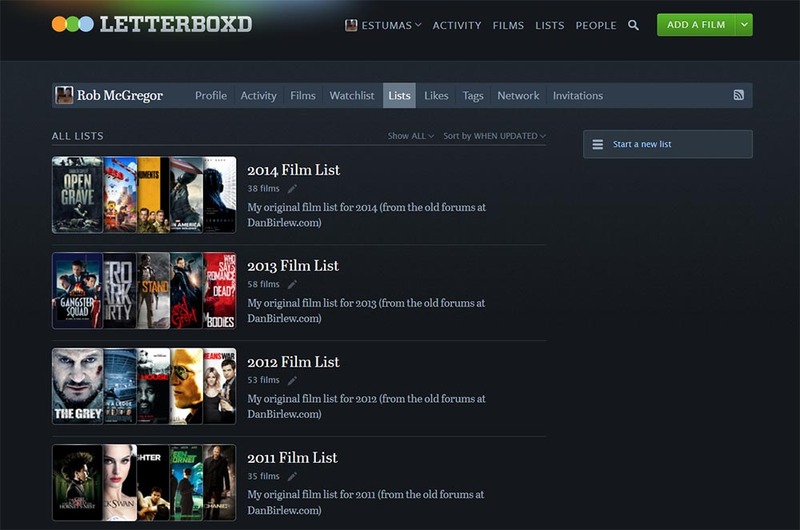 Dan however has more or less given up on having a forum space and it was dying off by itself, so instead I’ve just moved my lists over to Letterbox’d – which is a great movie watching site which allows you to catalog both lists of movies and ones you’ve just watched. For archives sake I’ve put up all of the previous years I’ve done and this year’s one into lists. 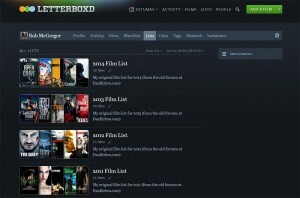 The only drawback is I used to be able to split my lists into categories of what I wanted to watch, what I might watch, and what I’ll likely be dragged to by others… however the lists on Letterbox’d – unless I split them myself – will just be one list. Ah well, can’t win them all. Posted in Collection, Movies, Website Links. Tagged film collection, film lists, letterbox'd, movies.